A while back I made my Perfect Pumpkin Spice Pancakes (those are so good, I want them all the time!) and wanted some syrup. But I don’t usually buy grocery store syrup, and I just wasn’t feeling maple syrup at all. Besides, that can be super pricey. And for some reason, the idea of a bacon syrup popped in my head. 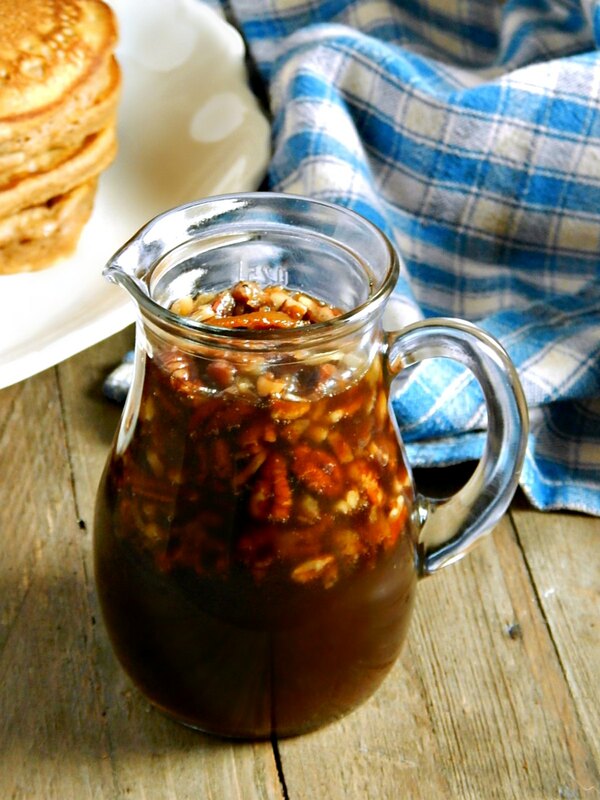 So here’s my Bacon Pecan Syrup…it’s a little special for a fun brunch experience. Making my own breakfast syrup was a little trick I learned from my Mom; that’s all we had when I was young, at least until Mom started buying it in the ’70s. I guess now it would be called a “hack.” Her’s was a bit simpler, but my Bacon Pecan Syrup follows the same principle. Mix together brown sugar and water, maybe a flavoring or two and maybe a just touch of butter and simmer till rich and slightly thickened. So I thought a bit about Mom’s old “recipe” and wondered, could I change it up & bring it up to date? Maybe combine my bacon flavors right in the syrup? I mean, c’mon. And then my mind went right to pecans, being this syrup was going on Perfect Pumpkin Pancakes and all. There’s just a little touch of bacon in my Bacon Pecan Syrup but it’s surprising how the flavor comes through. It’s subtle, but it’s there. The bacon flavor comes more from the bit of bacon drippings in the syrup than from the bit of actual bacon in it. And when I served my Bacon Pecan Syrup over my Perfect Pumpkin Spice Pancakes, the bacon and pecan flavors of the syrup melded so beautifully with the pumpkin spice from the pancakes. It was, well, heavenly. I think my Bacon Pecan Syrup would be great on apple or banana pancakes, too, and if you really want the bacon pecan flavors to come forward, try this on your everyday plain old pancakes. Keep this little recipe in mind whenever you need syrup; it doesn’t have to be bacon flavored, you don’t need the pecans (or you could use any nut) and you can make as little or as much as you want. You are just looking at a ratio of 1 cup of water to 2 cups of sugar, and about half a tablespoon of butter (if you aren’t using bacon drippings) and you can use any flavoring you’d like. A little extract, added after the syrup has cooled just a bit is all you need. The recipe couldn’t be simpler. A mix of syrup, a little water, and the bacon and pecans but there are a couple things to know. First of all, let’s start with the bacon. This recipe works best if a thinner bacon is used and one that’s not cooked to complete crispness. It’s better if the bacon, which is very finely chopped, isn’t hard bits in the syrup which will happen if the bacon is very crispy to start. And then there’s the bacon fat. Since many syrup recipes have a tablespoon of butter, just a little dribble of the bacon drippings substitute. A tablespoon in the pan, heated, is the perfect thing to toast the pecans in. And when the pecans are toasted, it always helps to up their flavor. It kind of wakes them up when the oils are heated. That toasting step isn’t absolutely necessary, though, because the pecans are warmed through in the syrup. When the syrup is done, serve as soon as possible. When it cools, it can crystallize. If that’s a worry, you can add a tablespoon of corn syrup to the recipe and it will help to prevent any crystallization. I always try to avoid that if possible, and the syrup can be gently reheated so any crystals melt away. Just don’t go wild and boil it a long time. A gentle reheat over low flame, stirring now and then does the trick. If you heat that syrup too much with the bacon in it, the bacon will cook more and crisp up a lot and then you’ll have hard little crunchy bits, which is a little weird, to me. This whole recipe is a huge money saving proposition. This is not only so much less than real deal maple syrup, but it also beats out the grocery store maple “flavored” syrups by a long shot, and they’re just corn syrup and additives. You can make this even less expensive by using plain old white sugar and a touch of molasses instead of brown sugar. Brown sugar is just white sugar with molasses added, and one of my fave things to do is to Make My Own Brown Sugar, but for a recipe like this, you don’t even have to make the brown sugar. Just put the ingredients in the pan to warm through. If you want to mimic light brown sugar, it’s a tablespoon of molasses to a cup of sugar and dark brown is 2 tablespoons of molasses per cup of sugar. I did mention the bacon flavor is carried more from the drippings than the actual bacon itself, and we all know bacon can be a bit pricey. When I drain my bacon, I keep a little jar in the fridge and use it now and then for special recipes. So if you aren’t making bacon, and have a secret little stash, that does lower the cost significantly for this syrup. Do shop well for your bacon and pick it up on sale. It’s usually on sale around every holiday; stash it in your freezer. If you’re like me and love bacon but try to avoid it for the most part, but still like to use small amounts to flavor different recipes, take it out of the freezer and just cut across the package to get what you want, then return it to the freezer. The bacon doesn’t usually freeze so hard it can’t be cut through, but if it does, a few minutes on the counter does the trick. The temptation to cook up a bunch and just eat it is gone! One slice of bacon is one ounce, or 1/16th of the package (a pound) so to get the equivalent amount mentally divide the package in half – one half = 8 slices, then in 1/2 again = 4 slices, then take 1/4 of that for the equivalent of each slice. In a saucepan, add chopped bacon. Turn on heat to medium-low and cook until bacon has rendered but isn’t completely crisp. Remove bacon and reserve, and when cool, chop it finely. Add pecans to saucepan and heat through until just fragrant. Add water and sugar and heat, stirring until sugar is dissolved. Ad the bacon back in. Syrup will thicken slightly as it cools; be prepared this syrup isn’t super thick. Bacon and pecans will float to the top, so stir before pouring. Keeps for about two weeks in the fridge; reheat gently. No brown sugar? No problem if you have Molasses in your cupboard. Use about 2 1/2 tablespoons for a lighter syrup and up to four and a half for a darker one. This entry was posted in Click here for Fabulous Food Posts and tagged Breakfast or Brunch Dish, pancakes, syrup. Bookmark the permalink. You certainly do know how to dress up a stack of pancakes…yummy. Instead of dark brown sugar and water, I used 4 cup pure maple syrup and added more 1 teaspoon cracked black pepper and 2 teaspoon cinnamon. It’s a big hit when using for pancakes. Ethel, that’s genius, especially, in my opinion the pepper!! I love pepper with so many sweet things; it adds such interest and i think helps the sweet from being so overwhelming! And of course, cinnamon would be so great in this! I appreciate you stopping by and can’t wait now to experiment more with your ideas! Maybe on waffles, next time!! Mollie your Bacon Pecan Syrup invokes memories of syrup making when my kids were growing up. We made mostly berry flavored and never even though of combining bacon and pecans. Sounds absolutely decadent. Now I have visions of crispy fried chicken and waffles with your bacon pecan syrup poured over the top or what about mixed with Ice cream. I wish you were! I have had the most awful neighbor move in behind me over the summer! If only they knew what they were missing out on because I’m always trying to off-load extra cookies, cake, brownies, etd! Hi Jhuls, thanks! I’m getting there! And I love that you always visit and have something wonderful to say when you host Fiesta Friday! Hi Gail, the pancakes are just the excuse for this syrup, lol!! You should open a restaurant! This sounds amazing! Oh my gosh, I always thought after I retired I would have loved to do catering, oh, but the work, lol!! Yum! Do you serve it hot or warm only? Hi Mimi, just warm; it picks up just a little body as it cools and is pretty runny when it’s real hot.